It’s certainly interesting to read about how Cuomo wants to deunionize a thousand workers who supported Zephyr Teachout. NYSUT, of course, is outraged. After all, we didn’t support Teachout and he wants to screw us anyway. But that’s not really what they express outrage about. How dare the governor take people out of a union? After all, unions support union, don’t they? In fact, in the case of NYSUT, they don’t. Even as NYSUT takes exception to the governor's latest juvenile snit, a whole lot of NYSUT employees are not unionized. Most of them are, but there’s a glaring exception. To wit, it's Executive Vice President Andy Pallotta’s staff. Most of them are not unionized, and have no bargaining rights. The justification given, I'm told, is that legislative staff must be available 24/ 7 during budget time and other crucial times. So what does that suggest? Are they to have no rights, to ignore their families, or not even have families? Lots of people, myself included, work extra hours all the time. That’s a by-product of having a job you love. But were they unionized, NYSUT says, these folks might not be available when needed. That’s a pretty poor excuse, in my view at least. If I recall correctly, that was the same justification GW used to not unionize homeland security. 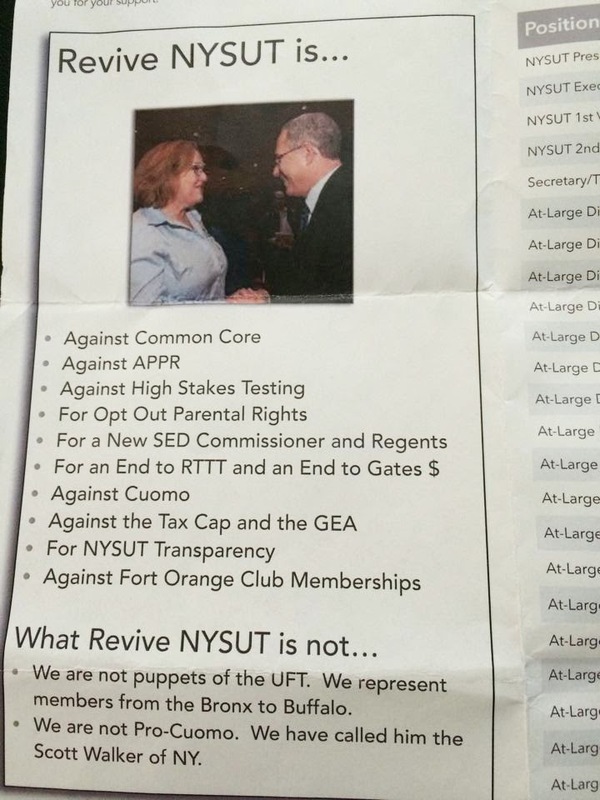 So Revive NYSUT, once again, finds itself in great company. Certainly GW's bro Jeb would share Karen Magee's passion for Common Core, and might even agree with her that the alternative is total anarchy. Sadly, they're both wrong. Now you might say, “Sure, NYC Educator, but Andy Pallotta’s a swell guy, and he would never fire anyone, because we union folks just don’t do stuff like that.” And I’d hope you'd be right, but you wouldn’t be. In fact, after the contested NYSUT election in April, I’m told a female staff member they deemed insufficiently loyal was fired with no due process. Of course, not being in a union, they don’t really need a whole lot of reason to fire anyone. In Andy's defense, I'm told he didn't want to get his hands dirty, so he had someone else do the actual dismissal. But NYSUT doesn’t affect us NYC teachers, does it? Well, in fact, the EVP in NYSUT has always been a UFT member. There’s a sort of power-sharing agreement there in which the EVP represents the UFT. Some people have told me the EVP pretty much ran the show until Richard Iannuzzi showed up claiming to be President, simply by virtue of having been elected President. The audacity! It's likely that's why UFT propped up Revive NYSUT. Now that they've dumped Iannuzzi and put in their BFFs, it's quite clear who calls the shots in the state union. Actually, much of UFT staff is not unionized. While they are UFT, they can be fired from UFT positions and dumped back into classrooms at any time. Thus many of them are fiercely loyal to whatever they’re instructed to be fiercely loyal to. After all, why would they want to turn down all those junkets and gala luncheons and be sent out to work with us lowly teachers? You don't think they want to be evaluated by junk science as we are, do you? I’m told the clerical staff at UFT is unionized, but they, of course, are not the ones with the all-important task of pimping the latest piece of crap contract, 2-tier due process, Common Core, or whatever gets us this week’s Seat at the Table. NYSUT leadership will preach no perks, but then pass legislation to benefit their leadership. NYSUT leadership will say they oppose Cuomo and fail to do so. They'll say they oppose Common Core but then support it. NYSUT leadership can be union, ostensibly support union, but concurrently deprive their very own employees of it. It's an abject disgrace.